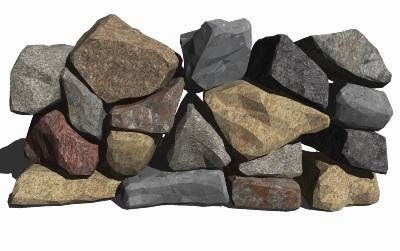 These are 3D models digitized from real rocks, stones and boulders, and free to use. Check out the whole beautiful collection at this link. This week I downloaded the neat Artisan organic modeling plugin for SketchUp, which I hear is the go-to plugin for fast and easy sculpting in our favorite 3D design program, at an affordable price. With the help of Fredoscale I created my first... um... experiment with Artisan. 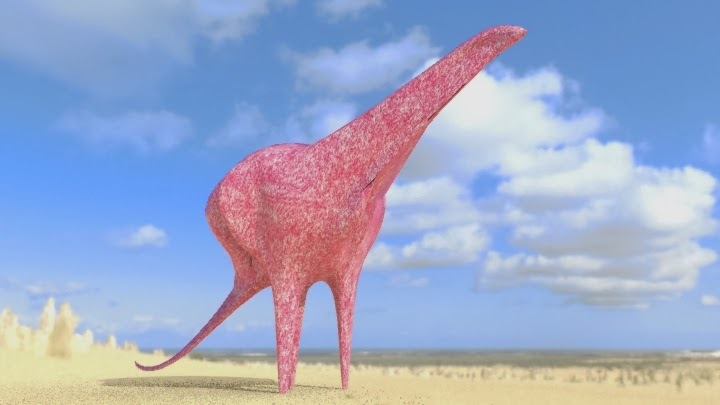 I call it Peeposaurus due to its resemblance to both a dinosaur and a Peeps marshmallow. Rendering done in Shaderlight. 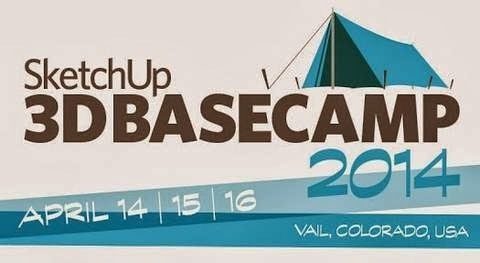 3D Basecamp 2014 Is Coming! I must thank my friend Filip, aka Athinaios of geo-modeling fame, for pointing me to this first. We had a real blast at 3D Basecamp in 2012, and I was just hankering for another, when this news came along. In 2012 in Boulder, Colorado, I met or reunited with many SketchUp modeling friends, ate great food, had fun, and learned a lot. Will you be there? Read the full joyous announcement here! Enter the Halloween-themed SketchUp 3D Challenge! The 3D Challenge community is looking for some new participants to join in the fun. 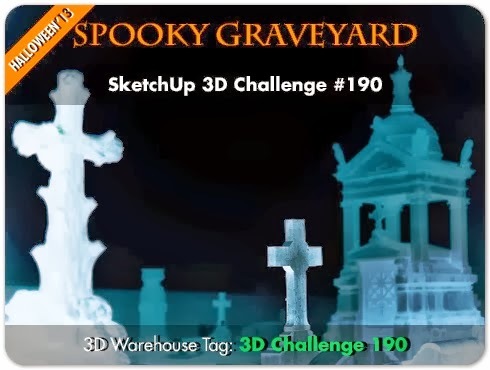 What better way to welcome newcomers into the group this month, than with a spooky graveyard theme? Think you have what it takes to win the challenge? You know you do, now show it! BOO! In honor of the geo-modeling community, which is now retired, I will do a series of geo "Show and Tell" posts, featuring models that never made it to the 3D pipeline, but were in the works. I have a lot of those. PLEASE submit your handsomest images of geo-models to share with the rest of us. Post processing is OK, and if it's a published Google Earth model let me know so I can note that too. Maybe your model will appear on SketchUp Island. 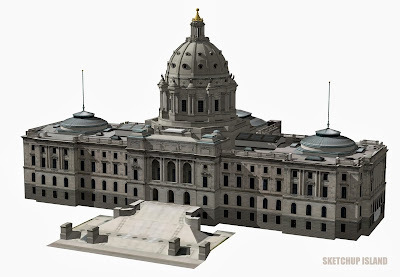 Seen above is my incomplete model of the Minnesota State Capitol building, which was never submitted to Google Earth for various reasons: I began geo-modeling professionally, and a nice version of the building was published anyway. Also my model was quite heavy with geometry, and some bugs in the file kept me from progressing smoothly. 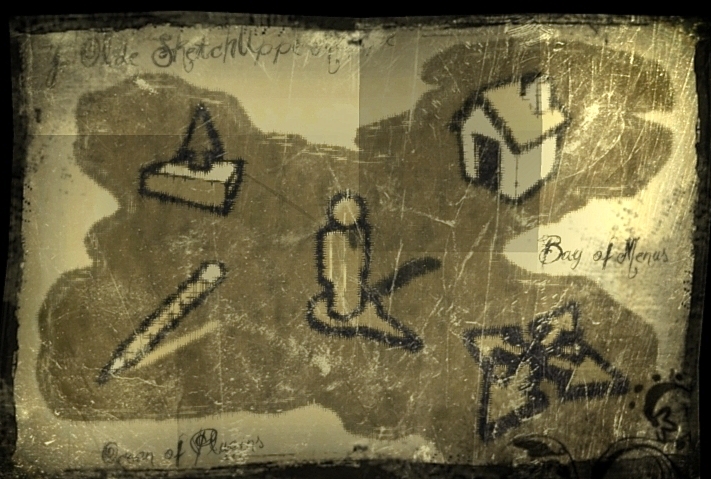 Still, I think it's a pretty sweet geo-model that would have worked, with some work! A remarkable short film for you to enjoy, employing 3D technology and artistry in a way never seen before! Enter the Maxwell for SketchUp rendering contest! The theme: "Out of Place." Your mission: take iconic places and alter them/ move them/ transform them into something fresh and unexpected! The Acropolis on the Moon? Sydney Opera House made from origami? The White House painted colorfully? Follow on Twitter @MaxwellRender (#MW4SU2013) and check out the contest details at the official website. Good luck! Meanwhile, back in the world of geo-modeling... Randall Crane has created this handsome addition to his Evansville, Indiana collection. I've added it to my collection 1900s. I tried out the free version of +SketchThis.NET's Kitchen Design Plugin (KDP) and here's what I came up with! 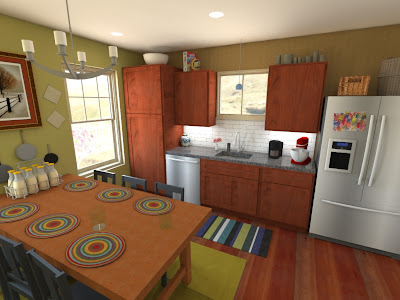 In brief, I placed cabinetry and appliances into my SketchUp kitchen, using the KDP library. The dynamic components allowed me to easily resize the cabinets. I swapped out the doors using the door menu and chose a cherry wood finish. I wasn't sure where to find counter tops, so I made one. Lighting was easy because Shaderlight-ready IES profile lights are included in KDP, as are small appliances and furniture. For whatever else I needed I borrowed some great knick-knacks found in the 3D Warehouse component browser in SketchUp. Final render in Shaderlight. Ta-da! The verdict: A pretty cool result, and it was fun to use. Anxious to see how this develops! I just downloaded the new Kitchen Design Plugin by +SketchThis.NET. Since it's free it didn't cost me anything to download, and I suspect I'll have fun with it. Want to try it out? Watch the trailer (the most epic kitchen design trailer, ever) and then download a trial at this link. Do you ever find yourself adrift in the Sea of Many SketchUp Plugins, or trekking unproductively through the Valley of Productivity Extensions? With so many great SketchUp tools to use, aren't you sometimes just... lost? Fear not! For a new beacon is here to light your path. 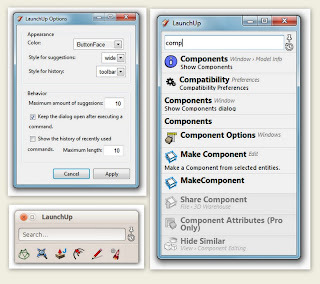 From famed SketchUp adventurer Aerilius comes a new plugin to organize and access all your plugins, tools, and other SketchUp extensions... 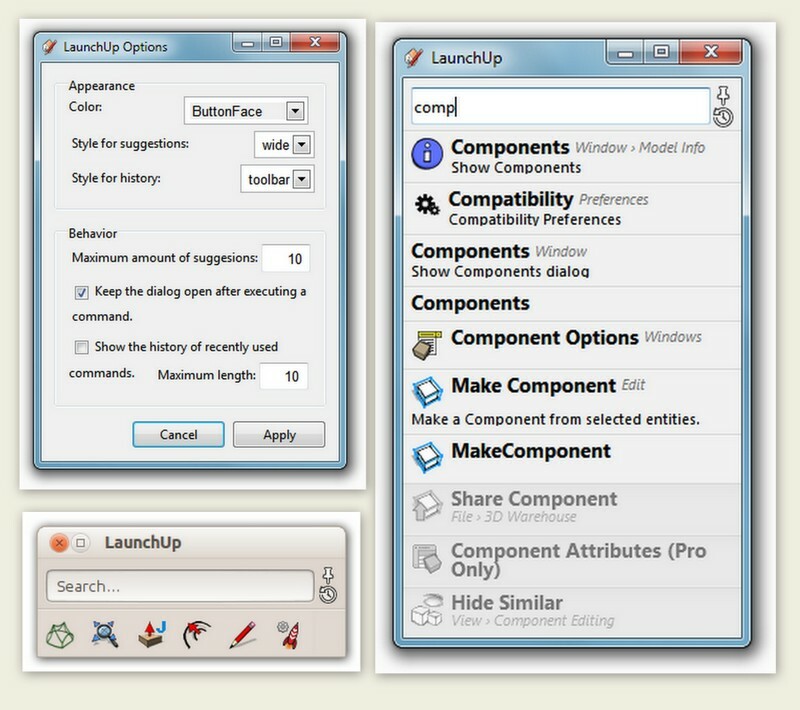 Behold: LAUNCHUP! I've tried it myself and it really does work well. Quite amazing. You should try it, too! Enjoy this new way of exploring SketchUp, and thank you, Aerilius! Via +Douglas Triana take a look at this video rendering of +Christina Eneroth's eye-popping, mind-blowing, inspirational-juices-flowing, German cousin-of-Hogwarts, 3D SketchUp model Schloss Eneburg. Christina (aka Eneroth3) has been building her Alpine "dream home" for years! See the original SketchUp model at this link. Modeler Aerilius says the pesky "halos" around your PNG transparency textures in Google Earth can be eliminated by grouping sections of the SketchUp model separately. Read more here. In the model above I tried this technique to avoid the PNG railings I had created from "burning through" the rest of the building. It helped! I also replaced transparent JPEG window textures with PNG files so that the interior can be seen through the windows. The transparent bucket colors in SU are JPEGs and don't appear transparent in GE. Check out this colorful and unusually shaped barn, modeled by Jean. Wonderful geo-models like this allow us to explore buildings we might otherwise never encounter! GO Green Team! GO Entourage! "The Green Team" is a cool collection of Google Earth greenery. Use it for inspiration and, as collector Ghaleb fawzi puts it, "to encourage ... beauty and [enhanced realism]" (in Google Earth). The vibrant 3D SketchUp model seen above is Donostia - Cristina Enea by gi3d. Check it out and all the other colorful models I've added to the collection Colorful Places on the Trimble 3D Warehouse! As happens usually with other buildings that do not exist anymore, the geometry work was the easy part. However, looking for other churches with similar caracteristics (sic) and some reference pictures was enough to get such a beautiful result. I just came across this model of Michael Jackson's Neverland Ranch by giotis (who also brought us the Sphinx). Pretty colorful and well done in my opinion! This great model of the Sphinx was created by talented 3D modeler giotis. Be sure to look at all his models because they do not disappoint! Bre Pettis of Makerbot wowed us all last October at 3D Basecamp with his Makerbot Replicator 2 desktop 3D printer. 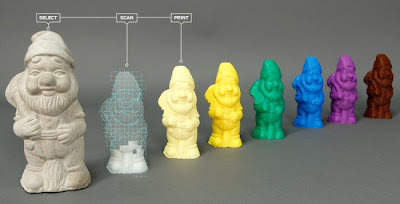 He's done it again by announcing desktop 3D printing soon will be a reality! The image above from Makerbot shows how a garden gnome or anything up to 8 inches in diameter can be scanned and printed within minutes. Want the scoop? Sign up for information at this link. Jack Kerouac's birthday is coming up (on March 12) and what better way to mark it than by sharing this attractive 3D SketchUp model by BerylDrue? According to BerylDrue Kerouac was Lowell, Massachusetts' "most famous writer." He would have been 91 a week from today. I've added this model to the collections Americana, My Favorite Thumbnails and House and Hotel. See this link for other "literary landmarks" modeled by Beryl. This is pretty amazing! A pen that heats a quick-cooling plastic allowing users to actually "draw" in 3D space. Here's a link to their Kickstarter page if you want to support the project. At the very least watch the video; it's pretty crazy! Another beautiful model from samothrace41! I've added it to the 3D collections Place of Worship and My Favorite Thumbnails. Wow, what a beautiful image and 3D model by Eugeni llopart! 3D modeler Keshan Perera brought it to my attention, calling it "one of my favorites." What do you think of it? Here's a refreshing take on some old models. 3D modeler extraordinaire Damo created a collection of what he considers to be his own eleven best geo-models (3D models made for Google Earth). What do you think of them?